In the center of it all describes so much more than Kansas City’s geography. 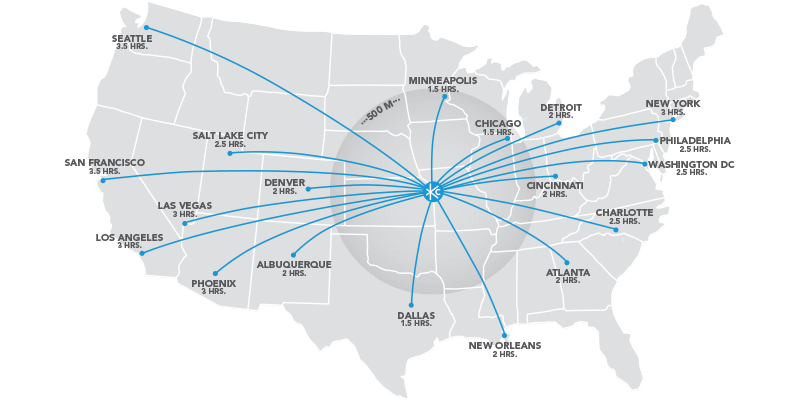 A convenient location for domestic and international travelers alike, KC’s central setting means it’s not only easily accessible by interstates and highways, it’s also a quick flight from just about anywhere across the United States. With 400 daily flights it is a convenient trip from many of the US's international gateway cities. This accessibility lends to its undeniable energy, too—whether it’s a national touring act stopping in for a one-off performance, a family reunion looking for the perfect midway meeting point or the meeting planner trying to please everyone. KC straddles the Missouri-Kansas state line, sometimes causing travelers to wonder which state they are in. You’re not alone! Here are a few tips to help: If you are west of State Line Road, you are in Kansas. If you are east of it, you are in Missouri. Follow the Missouri River to the north, and if you are west of it, you are in Kansas. East of it, you’re in Missouri.